with our enthusiastic, experienced staff. We cater to smaller groups, of up to 12 passengers. 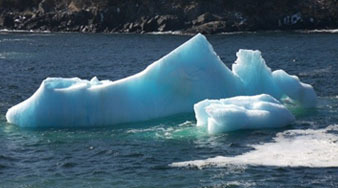 This gives you more personal attention while you enjoy a leisurely one hour tour of our ocean playground, with whales, puffins, icebergs, and so much more! , a group of volunteers devoted to rescuing puffins, and safely releasing them back into the Atlantic Ocean. need our help when they fledge towards the end of the summer. They often get attracted by lights, and fly into communities and onto roads instead of out to the open sea. monitors the roads at night to rescue lost puffin chicks, and keep them safe. The next morning, the puffins are weighed, measured, banded, and released for a second start of their new life. every night. 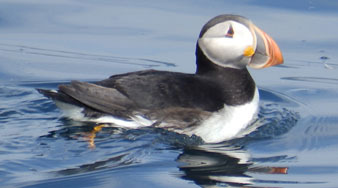 We also assist with releasing puffins back to the Atlantic Ocean. When there are too many predatory gulls near the beach, we dedicate the first boat tour of the day to give the little puffins a boat ride far out of reach from gulls. 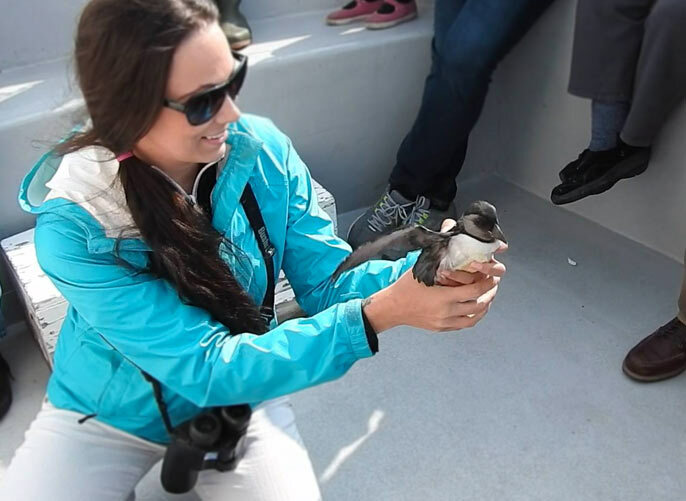 We release the puffins as a part of our boat tour, giving them a better chance to grow up and come back to the puffin islands. Jeannine was born and raised in Germany. Following receipt of her M.Sc. 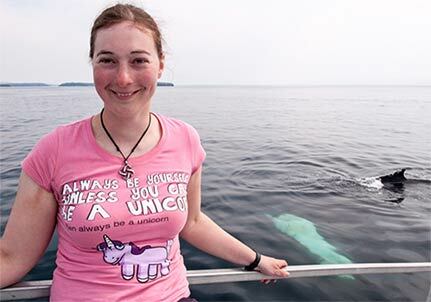 (Biology) from Ruhr University Bochum in 2008, she spent a year in Iceland working on horse and sheep farms and another year in Canada (in Kelowna, BC and Rocky Mountain House, Alberta) before moving to Newfoundland for her summer job as an interpreter on Molly Bawn Whale and Puffin Tours in June 2010. 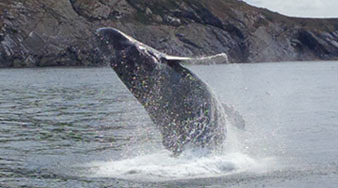 Because she fell in love with the land, the people, the scenery and whales and other wildlife of Newfoundland, she moved here permanently in 2011. Currently, Jeannine works as an interpreter for Molly Bawn every summer and as a seabird observer for CWS, going offshore for weeks at a time to count and identify all the birds the ship is passing. The boat is driven by Transport Canada certified skippers. On our tours we always try to make as little impact as possible on the reserve. 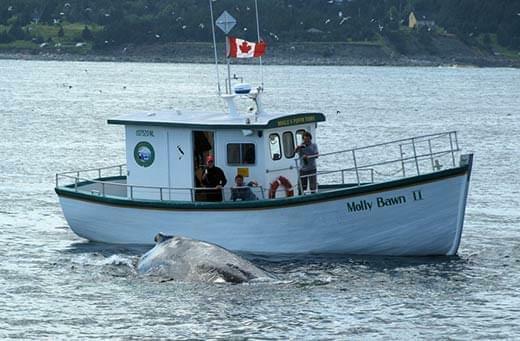 We slow down around animals in and on the water and try to keep our distance. 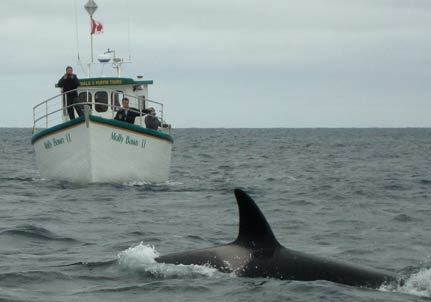 We avoid noise disturbance around both the whales and birds. Jeannine, our resident Marine Biologist, answers any questions and helps keep our passengers informed about the importance of this reserve. She also helps them understand how wonderful, valuable, and in need of protection marine life is. From the smallest marine critters up to the largest whales, everything is connected. Our Skipper makes sure that our passengers won't miss the Newfie-spirit on our tour. We also try to assist the researchers in the reserve, tell them about every exciting sighting and we are in close contact with the reserve manager to inform her about how everything is going in the reserve.